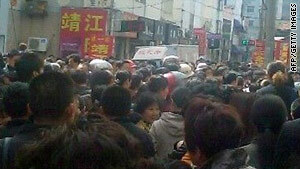 A crowd gathers outside a kindergarten in China Thursday where a man attacked more than two dozen children. (CNN) -- At least 28 children were injured when a man with a knife attacked a kindergarten in east China on Thursday morning, state media said. 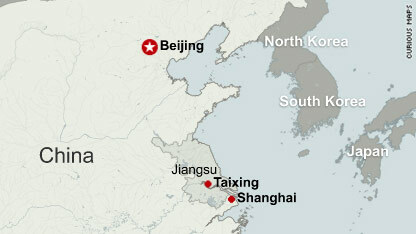 Most of the victims were 4-year-olds, the state-run Xinhua news agency said. Three of the children were in critical condition. Police said they have arrested a 47-year-old suspect. The incident happened in Taixing city in Jiangsu province. It comes a day after a man attacked 18 students and a teacher with a knife at a primary school in southern China's Guangdong province, Xinhua said. It was not immediately known how many people were injured or whether there were any fatalities Wednesday. The man, described as being in his 40s, entered Leicheng First Primary School Wednesday afternoon and committed the attack before he was seized by police, Xinhua reported. A man who stabbed eight children to death and wounded five others at an elementary school in eastern China last month was executed Wednesday, Xinhua said. Zheng Minsheng, 42, was shot in Nanping City for the March 23 attack. Authorities said he carried out the attack because he was frustrated at "failures in his romantic life," Xinhua said.